Funny Kinda Guy follows the transition from female to male of transgendered singer-songwriter Simon de Voil. From his first injection of testosterone to the point when his maleness is undeniable, the transformation lasts more than a year and a half, and takes him from his native Scotland to the other side of the world. There is freedom and happiness along the way, as his long-sought masculinity flourishes; but there is also sadness and loss, as he irreversibly sacrifices his female singing voice to hormone treatment. A musical odyssey, the film features Simon's well-crafted and original songs - it is a quirky self-portrait which gives the film its title. 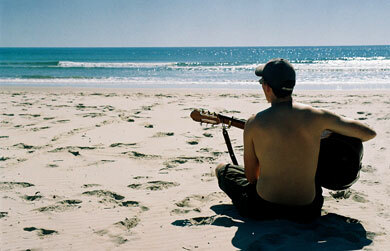 Simon's music accompanies us on the journey and allows us a unique and personal insight into his world. Travis Reeves was born in Australia in 1968, and emigrated to Scotland with his family at the age of 12. He studied painting and filmmaking at Edinburgh College of Art. His prize-winning first film as director-designer, Sad to Say but Sammy is Dead, recreated suburban Australia in a warehouse in Edinburgh. His second short drama, Waterloo was his first collaboration with Funny Kinda Guy producer Wendy Griffin. In 1999 he directed and appeared in A King is Born, a short film made for Glasgow's international arts festival, Glasgay! introducing drag king Travis T. During the filming, Travis met Simon de Voil, marking the start of a friendship and a shared gender exploration which led to the making of Funny Kinda Guy. He continues to explore gender issues, and has worked as make-up artist on Diane Torr's Drag King Workshop. Since the completion of the film, Travis has embarked on his own gender transition. 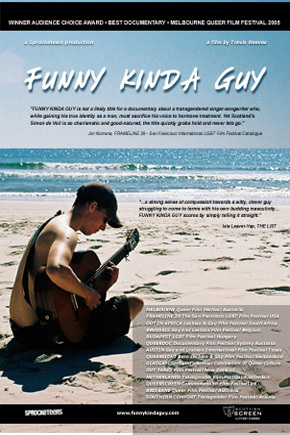 Funny Kinda Guy is Travis' first documentary and first feature.